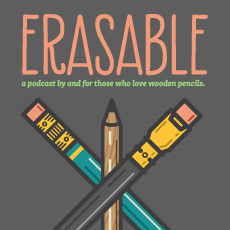 We just recorded a great episode of Erasable last night! We’re on our eighth episode (and going strong! ), and we discussed a lot of stuff: the new Field Notes, some reviews, et cetera. But I loved the main topic: Pencil Heroes. Johnny picked Earnest Hemingway and Tim picked John Steinbeck, both of whom are prolific pencil users and graphite advocates. I took mine in a slightly different direction — while in the future I want to pick a hero from literature (either fictional or a creator), this time around I picked the first person — someone who I know personally — and who popped into my head when the topic was first broached: Don Bell. In 2007, Don was the proprietor of PencilThings.com, the site from whence I bought my first sampler pack of pencils, and wrote a review on my personal blog. After sharing that with Don, he asked me if I’d be interested in reviewing products for him. After that, he called me and we spoke for an hour about creating a PencilThings blog. It was a grand initiative: we kept it at a separate domain and ran it as a publication independent of the e-commerce site. I posted, basically, whatever I wanted (with occasional guidance by him), and we built an audience. Many of my pencil friends I established there I still keep in touch with today. In 2010, Don sold the business to the current proprietors of PencilThings, and they took it in a different direction: Amazon and eBay sales. That’s what prompted me to strike out on my own, with this blog. Don and I still kept in touch a bit, but I haven’t heard from him the last two or three years. I don’t know if he’s still got a finger in the pencil game, or indeed, if he’s still alive. Any of you keep in touch with Don? Let him know I said hi. Anyway, you’re going to want to listen to this episode. Stick around until the the end when we announce the giveaway. It’s pretty great.